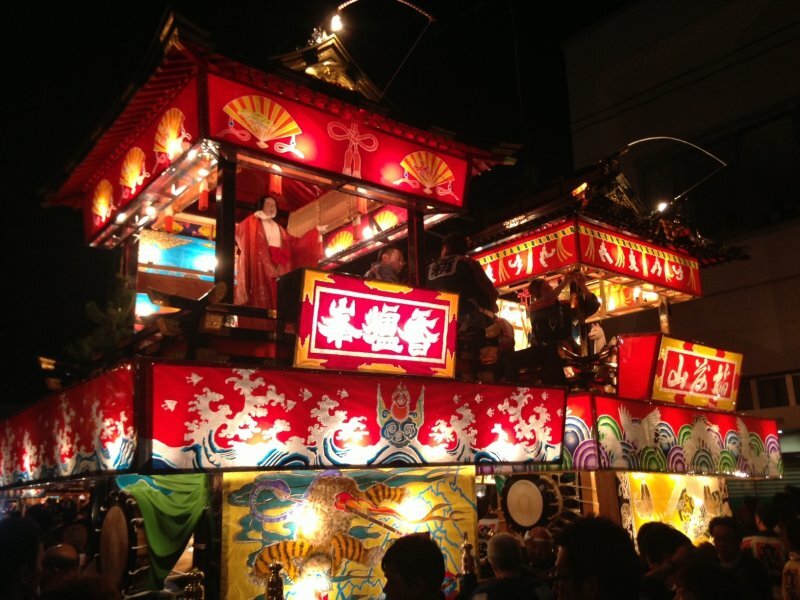 The "dashi" shrines of neighborhood gods. 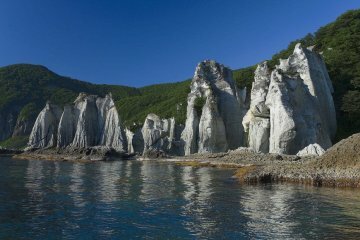 In the northern wilds of Aomori, a land of long winters and cold snowy nights, summer is held in divine regard. 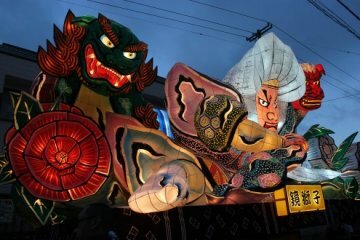 This can be vividly experienced during the three nights of the Tanabu Festival in the town of Mutsu. If you were to ask any local what one event their region is known for, what one event everyone is looking forward to, what one event is the last great hoorah before winter's onslaught, it is this very one. 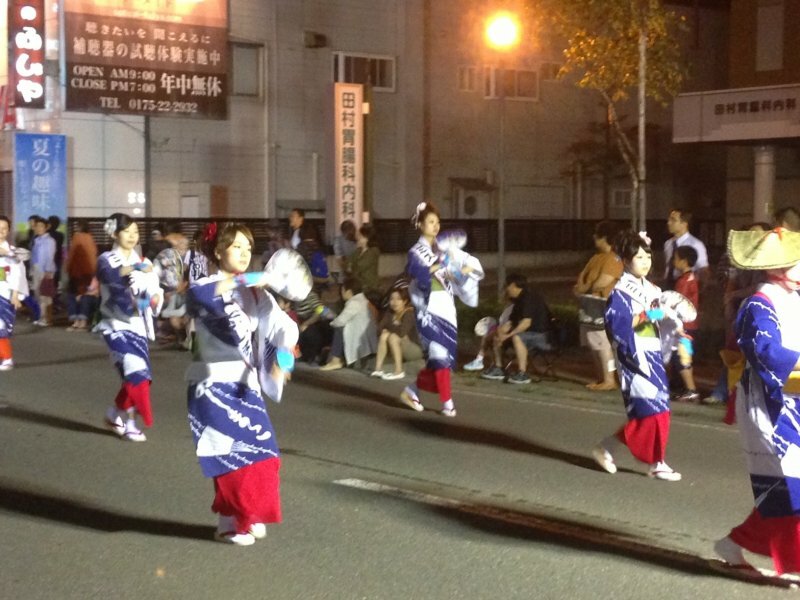 The festival spans three days, the first evening beginning with the "oshimako" dance. 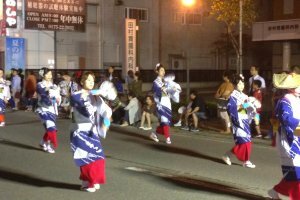 Men lead the procession carrying lanterns, followed in their wake by hundreds of women in traditional dress dancing the "oshimako" to centuries old music. The second night is the "mikoshi" night where several teams of men drink their body weight in beer, lay hold of a portable Shinto shrine (the mikoshi), and start chucking it into the air while yelling to lung's capacity and spinning wildly. 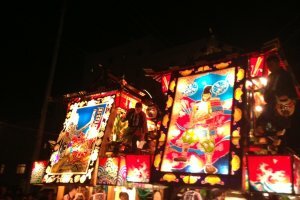 This author has participated in the "mikoshi" and can verify that hurling hundreds of pounds into the air, and entrusting the catch to a drunken cohort, is a great way pass the time. 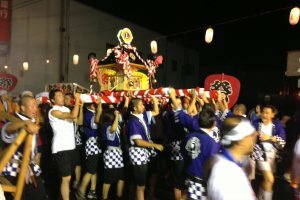 The "mikoshi" is used to transport the shrine's diety around the festival, while throwing him into the air is for his amusement. At least a thousand or so onlookers fill the streets, many dressed in traditional yukata, Each of the four separate neighborhoods of the aptly named "Tanabu" district in the town of Mutsu house their own portable shrines called "dashi" all year long, bringing them out to play for the festival. Each shrine is housed in a 15 ft tall structure resembling a mini-castle that is pulled along atop a wagon, with the image of the god on the top floor of the shrine. Each of the four wheels are wooden and probably decades old, having no axle so that a gang of men have to manhandle the "dashi" with ropes and poles to make it turn. Several people hang out in the shrines, playing flutes and drums. 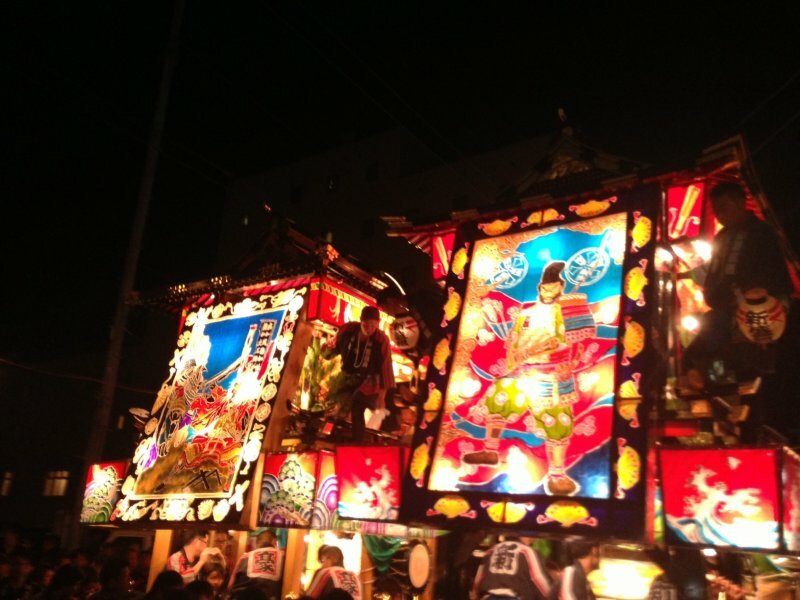 The shrines are pulled through the streets to the raucous shouts of "yama yare! ", to my best knowledge meaning "get it done!". 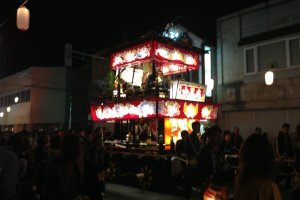 On the last night of the festival, the five shrines meet at an intersection for "goshowakare", the ritual where they separate and return to their respective neighborhoods until next year. 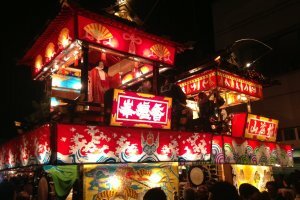 During this ritual, at around 10 PM, a giant barrel of sake is brought and men in priestly garb ladle sake out to all present until its empty. The festival has a few side attractions as well: food booths, "noh" plays and samurai dramas acted out on a stage, local bars and restaurants set up booths on the streets and offer cheap fares to entice customers. During the day one can see small groups of men carrying around their "mikoshi" and playing traditional music in the backstreets. Perhaps the most enjoyable aspect of the festival is the people. Being the land of long winters, this summer festival brings everyone out of their homes and brings out joy in everyone present. 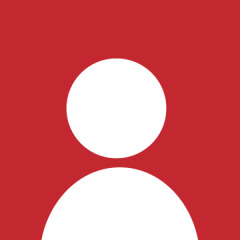 If you are looking to interact with local people, this is the best time of year to do so. The origins of the festival are unknown but have been estimated to be over 300 years old. 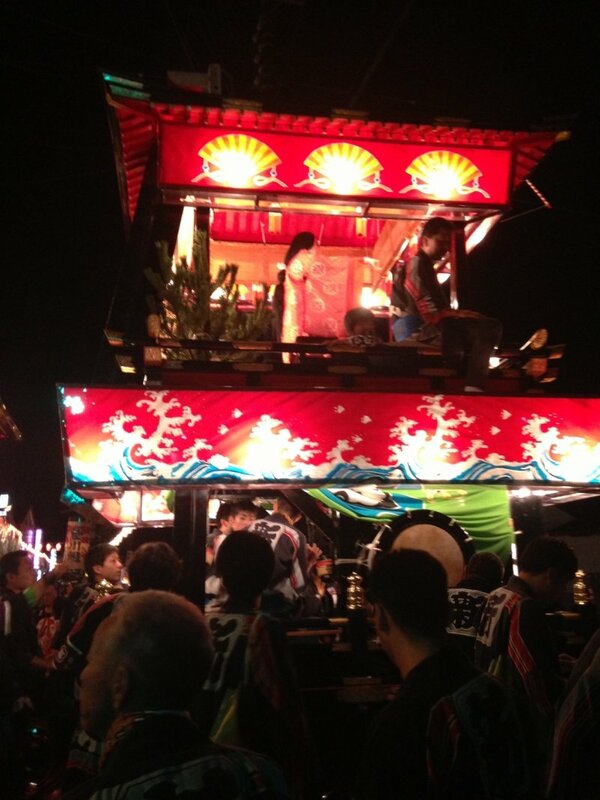 It resembles the Gion Festival in Kyoto in many ways. Each shrine houses a neighborhood deity. 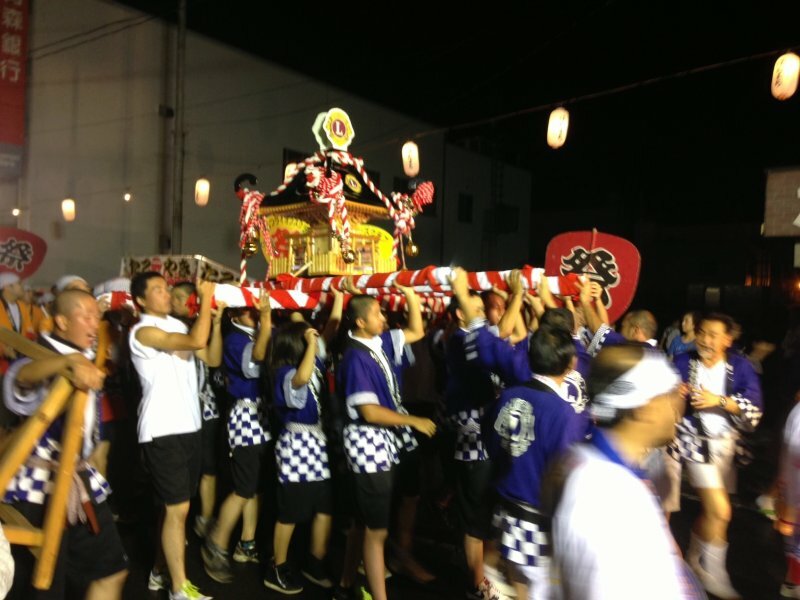 In the weeks leading up to the festival, the teams who pull the shrine will regularly meet, set the deity's statue in a place of honor, and get thoroughly drunk. 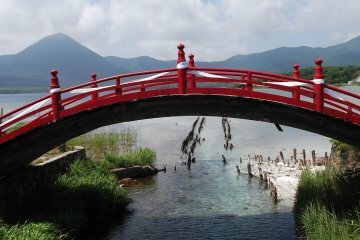 The name "Tanabu" relates to the town of Tanabu that existed before it was merged with another town called "Ominato", becoming what is the current town of Mutsu. 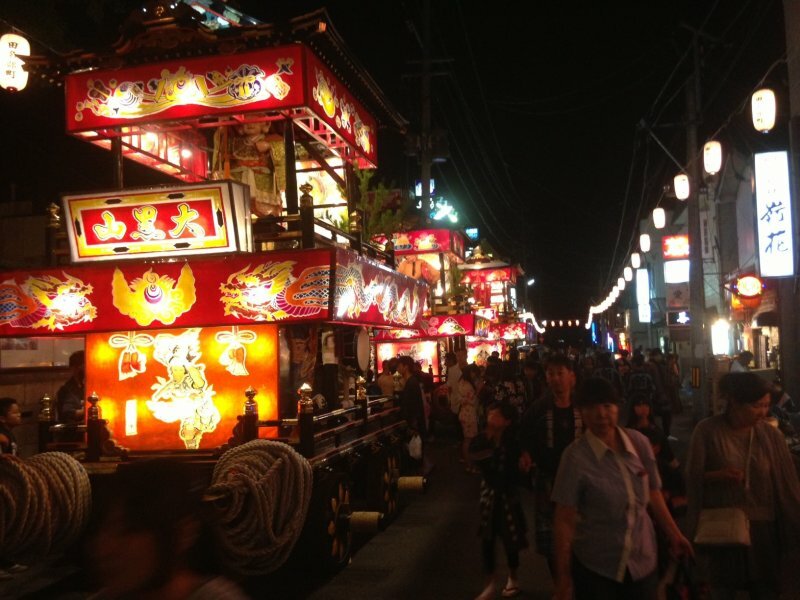 The festival is held every year in August from the 18th-20th from around 6 PM lasting until the shrine pullers just get too tired to go on. Food is offered among the plethora of food stalls, meals averaging out at $6. 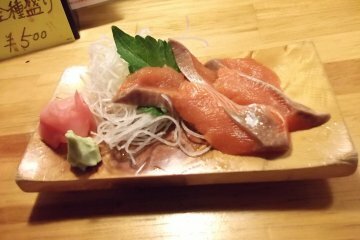 To get there, take a train from either the station in Aomori or Hachinohe city that will take you north to "Shimokita Station (下北)". 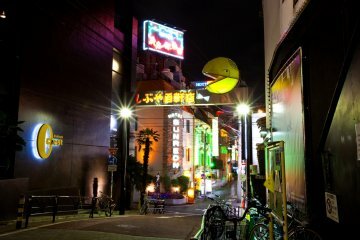 From there you can grab one of the taxis out front and just say "Tanabu" to get the festival. For those who wish to drive, just follow the pinned location on the map, but come early!! 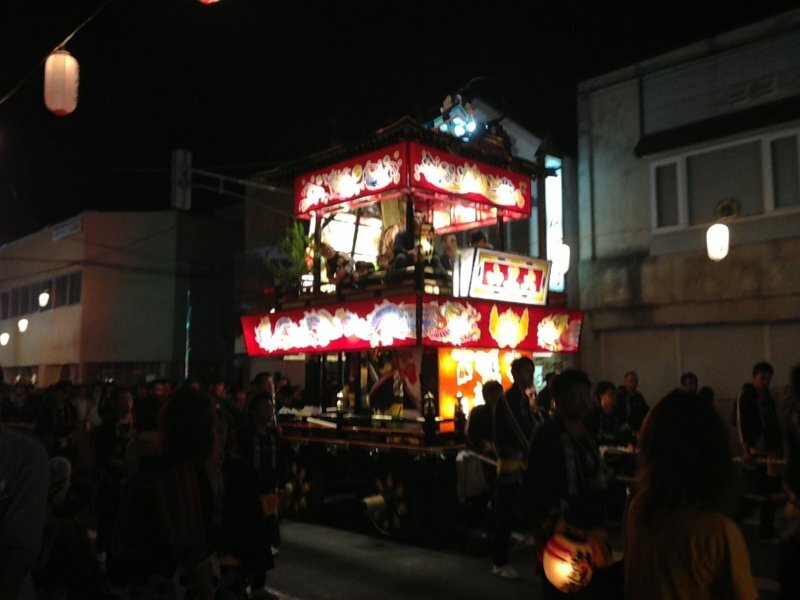 Everyone who has ever lived in Mutsu and moved away comes back during this time, so that means thousands more people than the town is accustomed to, i.e., parking near the festival will be scarce in the day, impossible at night. 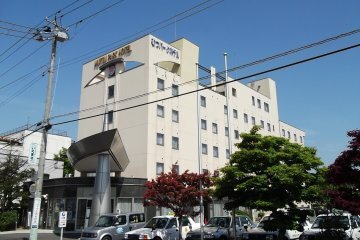 Your best bet is to get a hotel room near Tanabu months prior and walk to the festival. 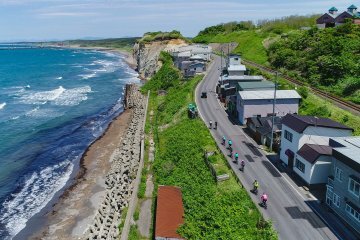 Aomori Bike and Sightseeing Tour..